In times of celebration or sadness and just about every social situation there will always be an offer of tea. From childhood through to our golden years, everyone loves a nice cup of tea. But as much as we love our tea here in Britain we have, in fact, been beaten in the amount consumed per person by Ireland and, more surprisingly, Turkey. In South America they consume the fewest cups per person, with Mexico at the bottom of the world table. The first tea in Britain came to these shores in the late 1600’s and by 1700 over 500 coffee houses were now selling it. In the early 1700’s we were consuming nearly 70,000 lbs of tea and by the 1780’s that figure went up to 5m lbs yearly. Initially, it was so expensive that only the very wealthy could afford it, however when Catherine of Braganza of Portugal arrived to marry Prince Charles II clutching her beloved tea the trend of tea drinking soon began to catch on. Soon, the fashion for drinking tea was so widespread that the taverns began to suffer as the poor were beginning to prefer a good cuppa to a gin or ale. In the early days of its popularity, tea was more likely to be drunk at home than consumed in the coffee houses and gin palaces. As a result of that, the ceramic designers and silversmiths began creating paraphernalia and accoutrements especially for this new found market. A well heeled home would always have fine china and an impressive tea set.The whole ceremony could be enhanced by having a stunning silver service with which to wow your guests. You won’t find a costume drama on television where the gentry don’t serve up the tea with a fine silver teapot and present the requisite sandwiches and treats on a fine array of silver plates, dishes and baskets. Presentation was everything and a key way to show off your status and excellent taste. There were and still are many of advantages to using a silver teapot. Firstly, it is a robust material and although it might dent when dropped it certainly won’t smash into a million pieces! Silver retains heat more than most materials and as a result your pot of tea should remain hotter longer. Owing to the thinness of the spout on a silver pot, serving the tea is less messy as it won’t drip when pouring. Also, a silver teapot is an investment piece and therefore its value over time should only increase and you can enjoy using it while it does so. What’s not to like? Add that to the simple enjoyment of making an everyday event into a special occasion and you can see why the popularity of these little pots has never really waned. Obviously, trend wise, tastes change and styles alter to suit so throughout time the evolution of the tea service reflects those moods. So, whether you prefer the sleek modern lines of the Art Deco movement or the highly decorated and embellished stylings favoured by the Victorians, somewhere out there is a teapot or tea service just for you. And, should you find yourself the proud owner of a lovely silver teapot, use it with pride and please don’t hide it away somewhere. To maintain its beauty simply wash with soapy water after use, dry thoroughly and give it a good buff. Occasionally, apply some polish, sparingly, and use a soft cloth to shine it up. It will sparkle like new. 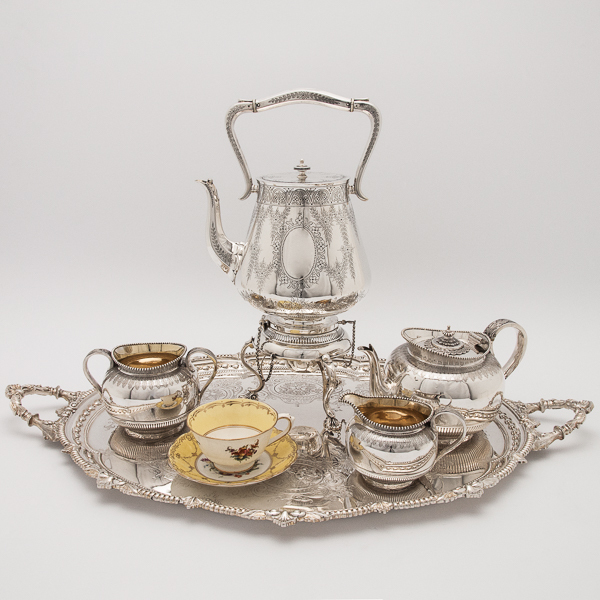 Like so many of the finer things in life, a silver tea set will only look better with age as the patina gets richer. So, use it, enjoy it, and give it the life it deserves.